Tyremarket.com is the fastest-growing player in the online tyre space with a network of more than 3,000 sellers, spread across 60 cities. 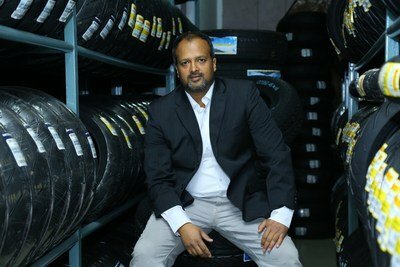 Tyremarket.com, the Bengaluru-based company, has become the leading tyre selling portal in India. The portal, which has witnessed an exponential growth in the last one year, now tops the Amazon Alexa website ranking charts in the tyre vertical. Amazon Alexa, an independent ranking agency, ranks websites based on the number of visitors and pageviews. The feat of the portal’s establishment as the market leader in online tyre retailing is the result of its strategic approach, which focuses on understanding a customer’s tyre buying concerns. Tyremarket.com has been very successful in suggesting to tyre buyers what tyre should they buy, based on factors such as their driving behaviour, budget, terrain utility, vehicle type, vehicle make etc. Tyremarket.com has smart product listings, which not only elucidates the features of every single tyre pattern but also showcases its comprehensive specifications in an easy-to-understand manner. “The way the products are displayed on Tyremarket.com makes tyre buying very easy for customers and every product on our website is displayed with its key attributes, which makes it very simple for tyre buyers to gauge the difference between all the tyre patterns and understand their specialities,” said Sanjeev. In a time span of just three years, Tyremarket.com has added many accolades in its portfolio, one such being ’10 Most Promising Automobile Portals in India‘, conferred by a reputed business magazine. And lately, its presence at the #1 spot in Alexa website rankings expresses the portal’s crucial role in the tyre industry. In the last two years, Tyremarket.com has seen an accelerating growth and its increasing orders along with a vast network of fitment partners speak in itself about the portal’s capability to fulfil the tyre requirements across the country. The products on the website are offered at very reasonable prices and it also runs exclusive offers from tyre manufacturers, time and again. The portal also has its strong presence on various social media channels. Its blog site, Tyre Mantra and the official Youtube handle are nowadays a go-to place for tyre buyers to get their tyre related queries answered in no time. Tyremarket.com is now ready for its next phase and aims to grow exponentially, garnering a lion’s share in the online tyre space. The management likes to keep the tyre buying experience hassle-free and simple. Michael Welch, Founder of UK-based Blackcircles.com is a Strategic Advisor & Investor to Tyremarket.com. With his global know-how of online tyre retailing, Tyremarket.com is now eyeing for a 10X growth in the next one year. Tyremarket.com is India’s largest pure-play portal for tyres. The Bengaluru-based startup provides convenience to its customers by helping them to choose the right tyres at the right prices. Presently, Tyremarket.com services more than 60 locations in India and has a network of more than 3,000 fitment partners. Tyremarket.com has its dedicated call centre team, fulfilment team and tyre experts at multiple locations, who ensure that a distinguished and a class-leading experience is delivered to the tyre buyers. Tyre buyers can either visit http://www.tyremarket.com to shop for tyres for their cars or two-wheelers, or call the portal’s customer support on +91-8088090090.